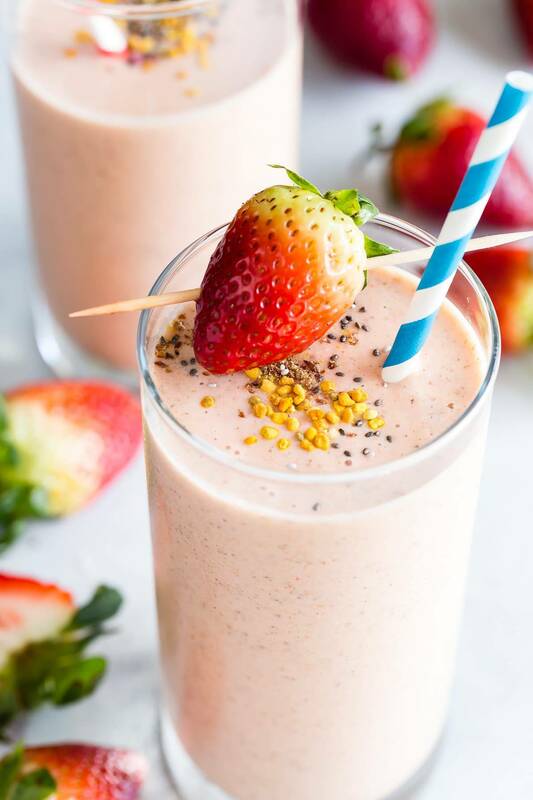 An easy-to-make and super tasty strawberry protein smoothie loaded with veggies, nuts and frozen strawberries. This is a perfect way to start your day! Hi everyone! First off, I wanted to say THANK YOU for all the kind words left after my first Fitness Gracious post. At first I was a little shy about publicly documenting my year-long weight loss journey (Hi employer! Hello mom!). But the warmth of your welcoming words to this blogger world has me hooked! I already have a list of over 40 topics I plan to cover every two weeks – that should last me a while, but feel free to send more thoughts along! One recurring idea people had was for me to suggest recipe ideas. Well, that makes sense – this is Foodness Gracious’ home turf, after all. In fact, I will be offering my Fitness Gracious stamp of approval on several of the healthier concepts my husband has come up with in future posts. But my first suggestion is nowhere to be found on FoodnessG– until now. 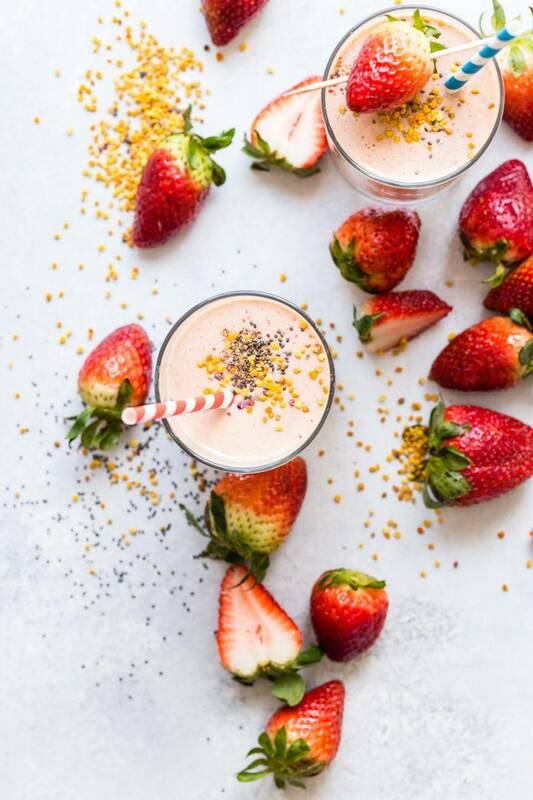 Behold – the Metabolism Boosting Strawberry Protein Smoothie! When I first started going a little fitness nutso last January, I asked around what people liked to eat for a healthy breakfast. My girlfriend and fitspiration Lisa suggested trying a green smoothie. It was simple – get a handful of Power Greens from a big Costco bag, add a scoop of chocolate pea protein powder from Sprouts, a handful of baby carrots, some water and ice, blend and drink up. It was hearty, healthy, and was my go-to breakfast along with a slice of Dave’s Killer Bread, toasted and topped with almond butter and banana slices. But, as one does, I got bored. 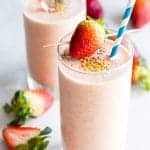 About six months in, my girlfriend Jessica suggested the Metabolism Boosting Strawberry Protein Smoothie. To its ingredients, I added carrots (a great sweetener, it seems) and chia seeds. I do prefer cannellini beans to the garbanzos, and frozen broccoli keeps the smoothie colder longer. The pix here also show a sprinkling of bee pollen – I could take or leave them, they’re just in here because they were in the fridge and I figured they couldn’t hurt in appropriate moderation. I had to half the entire thing to make sure the ingredients fit in my Ninja blender. I love my blender so – it’s got a strong (albeit loud) motor, and the blender containers double as my drink ones, so less cleanup. More efficient a.m. recipes = greater chance it’ll be consumed more often. Eight months later, this drink is STILL my go-to breakfast, in my hot little hand at school drop off, and keeping me full until early lunch. Try it out! Play around with it. Let me know what you think! 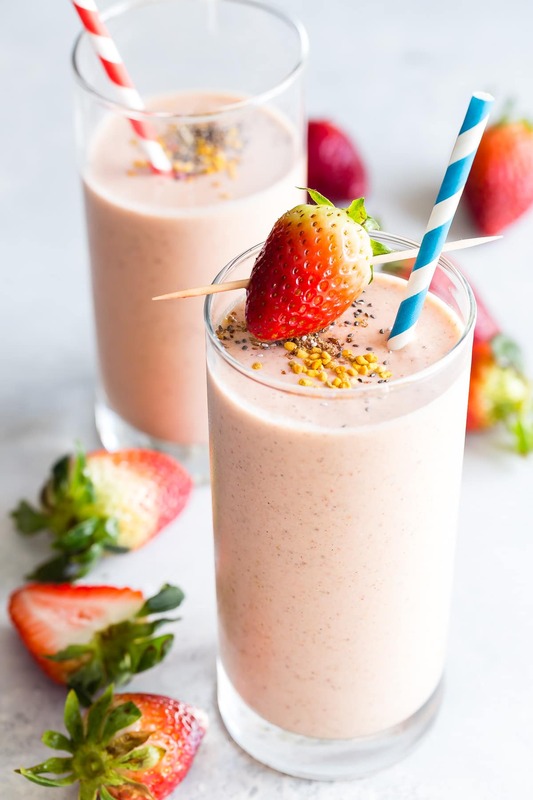 An easy-to-make and super tasty protein smoothie loaded with protein and frozen strawberries. This is a perfect way to start your day! Add all of the ingredients to a blender and blend on high speed until smooth. Perfect timing! I was just thinking that I was getting a little bored with my morning green smoothie – excited to try this one!! I love protein shakes but have never thought of putting broccoli or carrots in! I’m excited to try it! Have you ever tried cauliflower in your smoothies? It makes it extra creamy! !